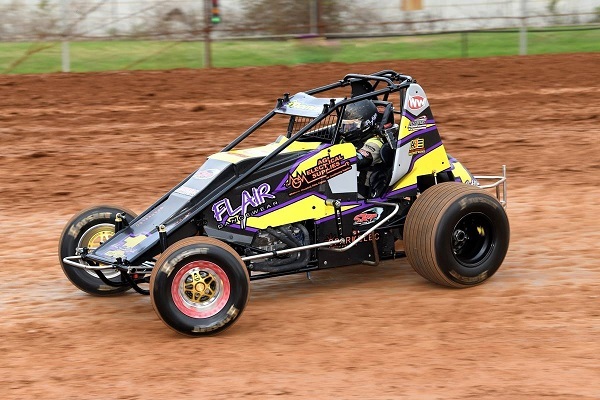 This Saturday night’s NSW Wingless Sprint Title at Sydney’s Valvoline Raceway will be the perfect way for participating drivers to ring in the New Year; even more perfect for the driver who manages to come away with the state title spoils. Taking place at the premier Sydney venue for the second consecutive season, the NSW Title has once again attracted a bumper field of 46 drivers from all around the state, including some from interstate, and with so much competition amongst the ranks, it’s anyone’s guess who will claim the crown. Despite having only made limited appearances so far this season, there is going to be plenty of pressure on defending NSW Champion and Valvoline Raceway track specialist Dean Thomas. Having also clinched the final podium place in last season’s Australian Championship at Valvoline Raceway, the Sydneysider knows just how to handle the pressure of title events and he’ll be hoping to take advantage of that when he takes to the track, where he will be joined by his older brother and another front-running contender in Jeff Thomas. Lismore’s David Eggins can’t be overlooked after experiencing a stellar start to the 2018-19 season, which has already resulted in four feature-race wins. Eggins narrowly missed out on a top-three result in last season’s NSW Title, coming home in fourth, which is a fact that he’ll be hoping to rectify this Saturday night. Currently sitting third in the NSW Club Championship point standings, veteran racer Mark Blyton has already tasted feature-race victory this season at Valvoline Raceway, and he will be a likely candidate to take out the mantle this time around after proving his ability in last season’s title, when he powered from position 10 start to finish in the runner-up spot. Former NSW Champion Jason Bates has continued to demonstrate that he knows exactly what it takes to win feature races this season, collecting a pair of wins at Valvoline Raceway and Gilgandra Speedway, which have earned him enough NSW Club Championship points to see him sitting at the top of the leader board. Leading the interstate contingent will be Travis Millar, whose current Victorian Champion status alone proves that he has what it takes to win the event, having also enjoyed a consistent start to the 2018-19 season back home in Victoria. Aussie Racing teammates Ashleigh Jack and Luke Sayre will be expected to fare well during the NSW Title event, with Jack having placed just outside of the top five in last season’s title and currently sitting second in the Club Championship point standings. Sayre’s consistency last season rewarded him with the runner-up spot in the NSW Club Championship point standings, where he is now sitting 11th, but he is no doubt looking to get his season back on track with a front-running NSW Title result. Collecting several positive results so far this season, which included a recent Valvoline Raceway minor podium finish, sixth-place NSW Club Championship sitter Zac Pacchiarotta cannot be discounted, along with seventh-place sitter Jamie Dicker, who came home fifth in last season’s NSW Title after charging from position 13. Also looking for a positive result will be local driver Kyle Mock, along with Marshall Blyton, Jack Gray, Parker Eveleigh and a host of other contenders, who will all be vying for the NSW Title crown. The NSW Title format will see drivers contest two rounds of 10-lap heat races, a 15-lap B main and the NSW Title deciding 25-lap feature race.